A couple therapy sessions ago, I was talking about how I used to be passionate about so many things and I used to ENJOY doing so many things. Then last week (or so) a memory popped up on Facebook that said I had just finished a 10 mile bike ride with no breaks. It brought up the therapy session again. 1) Read books. Growing up and all through my K-12 life, I loved to read and read thousands of books. I'd read different genres, both fiction and non-fiction. I continued to read off and on as I started college, but as the years progressed, I found that having so much to read for school made reading for fun seem a bit off-putting. I got through the first four Harry Potter books, made it through all the Twilight books, started the Sisterhood of the Traveling Pants series, read a James Patterson novel here and there, got about 14 books deep on the Janet Evanovich Stephanie Plum novels... then crickets. I told myself that as soon as I finished my Masters that I would read a book for fun. So, I picked up a suspense novel from the shelf at Goodwill and I read it. I liked it. I fell in love with Gone Girl, so I read a couple Gillian Flynn books. I liked them. But then I stopped again. 2) Ride my bike. 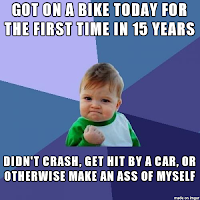 In the summer of 2010, I started riding my bike at least four days a week. It was peaceful. I would leave the kids at home with their dad, put my headphones in and just enjoy the ride. I got to the point where I was regularly riding 6 miles at a time. It felt good and definitely did NOT feel like a chore. 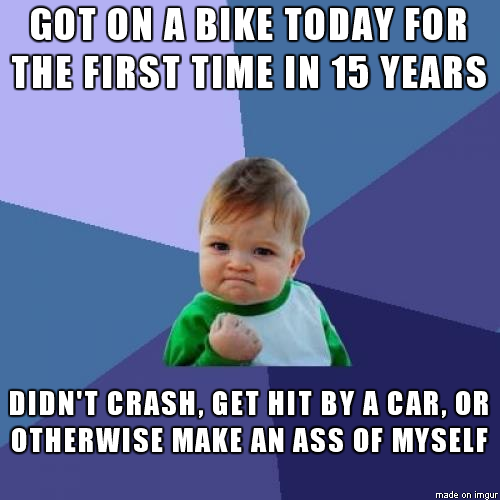 After moving in January 2011, I stopped riding and have never been able to get back into the stride. And boy is my waistline angry! 3) Create. I am simply saying "create" because there are several creative outlets I used to have, whether it was crafting, drawing, writing, blogging, etc. I just need to let my mind kick back and do something to work on my focus and inspiration. Of course, just like a list of NYE Resolutions, I'm not getting my hopes up. When it comes to the bike riding, I don't like humidity, so that is slightly weather-permitting right now. I perused the clearance bookshelves at a local thrift store yesterday and found about 3 books that I liked that didn't seem like they would be part of a series- I can't commit to that right now. So wish me some silent luck in any way that you can. I have no idea what my motivation would be, but I do know that joy is something that is severely lacking in my life and has been for years. I figure that if I can get to the point where I ENJOY something, that counts as joy, and I will take what I can get! What is something that you have lost your passion or drive for? Let me know in a comment or as always, hit me up on Facebook or Twitter!